Sling the words Caribbean, West Indies and music together and your thoughts will, more than likely, head straight towards the reggae end of the spectrum, maybe with a passing thought of Cuba, Latin rhythms and the Buena Vista Social Club and possibly crossing to the shores of South America and Trinidadian calypso. I guess that’s a natural reaction in the English-speaking world, where West Indian equates to reggae, calypso, cricket and rum, but we tend to forget there were other European nationalities that headed across the Atlantic to the Caribbean, and it might come as some surprise to learn how diverse the islands are, at least in terms of colonial dominance. We think English and Spanish, possibly French, but we tend to ignore or forget the presence of the Dutch and the fact that the Virgin Islands were, at one time Danish and Norwegian colonies (the Danes sold them to the United States in 1916). That interest dates back to the middle of the seventeenth century, a time when the Swedes had North American colonies in Delaware, Pennsylvania and New Jersey and Caribbean interests. The Swedes also controlled the island of Saint Barthélemy in the Leeward Islands between 1784 and 1878. Geographically (and there’s a point to all this rambling, don’t panic) the West Indian islands can be divided into two main groups, the Greater and Lesser Antilles, with a couple of extra groups covering the Bahamas and the Turks and Caicos Islands (the Lucayan archipelago) and the Leeward Antilles, Dutch colonies off the coast of Venezuela. The Greater Antilles covers the big islands, namely Cuba, Hispaniola (Haiti, the Dominican Republic), Jamaica and Puerto Rico with the Cayman islands just thrown in to confuse matters. Think standard forms of Caribbean music and that’s largely where it comes from. Figures. Big islands tend to have big populations and get the chance to develop their own music industry with their own individual styles, which is more or less what happened with ska, bluebeat and reggae in Jamaica. Things are much more confused, and subsequently diverse in the smaller islands of the Lesser Antilles, covering the Leeward Islands (assorted United States, British, French and Dutch possessions and a couple of independent former British colonies) east of the Greater Antilles and the Windward Islands (largely independent former British colonies and the French island of Martinique) stretching down to Trinidad just off the South American coast. What we’re looking at here comes from Guadeloupe (at the eastern end of the Leewards) and Martinique (Windwards). They’re not all that far apart, separated by the former British colony of Dominica. Interestingly, the two islands are overseas departements of France, first colonised by France in 1635 and literally, as a part of France, members of the EU that use the Euro. Put that way and it all sounds a bit white bread, but given the Caribbean confluence you’re in for African and Latin influences on Haitian, Congolese and Puerto Rican rhythms and the local biguine style that ruled the airwaves and dance floors of Martinique and Guadeloupe in the 1960s thrown into the mix. Listing those elements you can start from gwo ka and bélé, the drum and vocal call-and-response traditional styles of Guadeloupe and Martinique, reflecting the islands' history of slavery and forced migration. The lilting biguine is more urbane, a synthesis of bélé rhythms and brass-led polka from Martinique with ties to le hot jazz from Paris. Throw in some Congolese rumba, Cuban and Haitian rhythms, Trinidadian calypso, American and French hot jazz, and you’ve got an imaginative combination that makes for interesting listening. Not that you’re going to hear anything that’s too familiar, or recognize names like Barel Coppet et Mister Lof, whose Jeunesse Vauclin gets things off to a lively start, followed by Haiti's Les Loups Noirs’ Jet Biguine, complete with psych-out jet effects. Apart from recording in Martinique Les Loups Noirs apparently spent much of their time travelling between Haitian communities in, among other places, New York and Toronto, as well as throughout the Caribbean. You could probably come up with equally intriguing stories if you delved deep enough, and spend any amount of time trying to figure out the influences on tracks like Abel Zéno’s Pas O Soué La, Raphaël Zachille’s Manzé Mona or the Robert Mavounsy Quartet’s Henri Te Vlé Mayé but in an environment where Hughesy’s vaguely-remembered High School French isn’t enough to translate the titles I’m inclined to sit back and enjoy the grooves instead. La Vie Critique by L’Orchestre Jeunesse de Paul-Emile Haliar might translate as The Critical Life, but doesn’t sound like a nitpicker in action, while Orchestre Combo Zombi et Michel Yéyé’s Mussieu A Têt’a Poisson La has something to do with fish, though I’m not sure about the shape or form. I was tempted to come up with equally vague remarks about the rest of the album’s diverse array of styles and buoyant bounce but, in the long run, decided Tumbélé is something to be enjoyed rather than analysed. 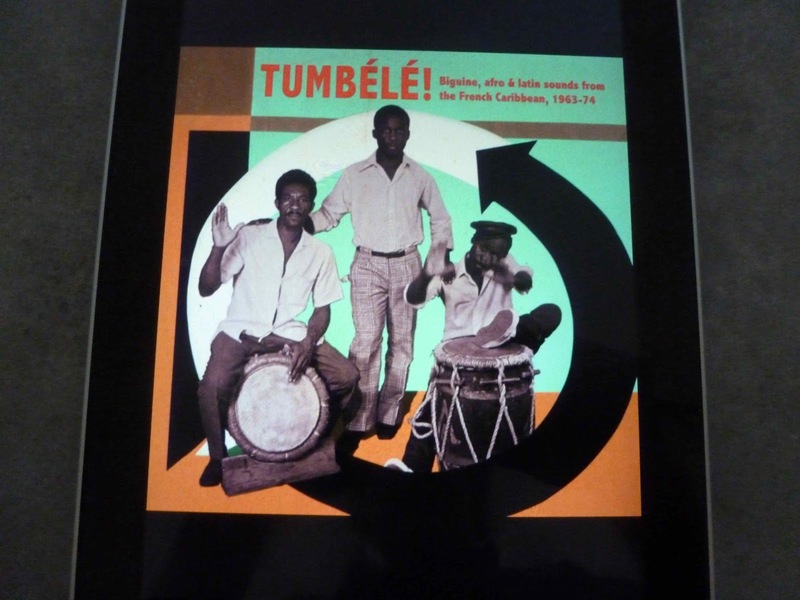 The sounds on this particular album sit on the fringes of familiarity, but there’s an exoticism that suggests a flow of people, cultures and traditions, backwards and forwards between metropolitan France, the Caribbean colonies and their neighbours and the African sources that drove so much of the music that came out of the Americas. Forget classifications and generic definitions, this exotic concoction of French, African, Calypso, Latin and assorted local flavours is bound to add more than a desh of interest to a playlist, and I’m definitely looking for more. I have a sneaky feeling I'll be taking a good long look at the catalogue over at Soundway Records. The difficult part is going to lie in deciding where to start.